The TreeView type exposes the following members. TreeView Initializes a new instance of the TreeView class. SelectedItem Gets the selected item in a TreeView. SelectedValue Gets the value of the SelectedItem property that is specified by the SelectedValuePath property. SelectedValuePath Gets or sets the property path that is used to get the SelectedValue property of the SelectedItem property in a TreeView. OnSelectedItemChanged Raises the SelectedItemChanged event when the SelectedItem property value changes. SelectedItemChanged Occurs when the value of the SelectedItem property changes. SelectedValuePathProperty Identifies the SelectedValuePath dependency property. SelectedValueProperty Identifies the SelectedValue dependency property. The TreeView control displays data in a hierarchical manner. The TreeView control is an ItemsControl, which means you populate the control with content by setting its Items or ItemsSource properties. The following illustration shows an example of a TreeView control. Typically, a TreeView control contains TreeViewItem objects. TreeViewItem objects can contain a header and a content item, such as another TreeViewItem, which can contain a header and another TreeViewItem. 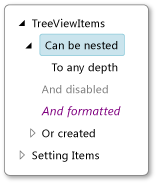 These nested TreeViewItem controls provide the hierarchy of the TreeView control. The TreeView control enables the user to expand or contract nodes in the hierarchy by using the mouse or the keyboard. You can get the selected item using the SelectedItem property. When the selected item changes, the SelectedItemChanged event occurs. You can bind the TreeView to data and use a HierarchicalDataTemplate to display the data in a hierarchical manner. You use the ItemsSource and ItemTemplate property of the data template to specify the source and format of the next level of data that is contained in the TreeView. For more information about how to use a HierarchicalDataTemplate with a TreeView, see How to: Use a TreeView to Display Hierarchical Data. When the TreeView is bound to data, you can retrieve items by their index or container by using the ItemContainerGenerator associated with the TreeView. For more information about the different kinds of controls and content they can contain display, see Control Content Models. The TreeView control is available as part of the libraries in the Silverlight Software Development Kit (SDK). For more information, see the Silverlight Tools. You can set a custom style for the TreeViewItem objects contained in the TreeView by setting its ItemContainerStyle property. To apply the same property settings to multiple TreeView controls, use the Style property. To change the visual structure and visual behavior of a TreeView, copy and modify its default style and template. For more information, see Control Customization. Dependency properties for this control might be set by the default style of the control. If a dependency property for a TreeView is set by its default style, the property might change from its default value when the TreeView appears in the application. For more information, see Dependency Property Value Precedence. You can get the default style and template for TreeView from TreeView Styles and Templates. Setting a visual property will only have an effect if that property is both present in TreeView control's default template and is set by using a TemplateBinding. You can find a list of visual properties in the "Changing the Visual Structure of a Control" section of Customizing the Appearance of an Existing Control by Using a ControlTemplate. The following code example show a simple TreeView control. To use the XAML markup, you will need to change the Source property of the Image objects to an absolute or relative URL of an image on your computer.